a land where thou shalt eat bread without scarceness. Julia Skeen’s visionary paintings transform three widespread cognitive disorders of urban homo sapiens: fudging, gulping and forgetting. Fudging is looking without seeing. Gulping is careless consumption devoid of grace. Forgetting is dislocating our being from the biosphere which sustains all life on the planet. These three habits of thought shape much of the behaviour that destroys the natural environment. We look at a packet of soya in the supermarket and do not see the miles of rain forest cut down to make a field. We gulp down a hamburger at a takeaway and rush back to work, anxious consumers whose creed becomes I shop therefore I am. We switch on a light at home and forget the acid fumes of the power-station pouring into the sky. The kitchen is a site of such behaviour. The oven, hob, electric plugs, the light-bulbs, geyser, heater, the taps and fridge are brilliant triumphs of a tool-making species. Used by billions of people, they become weapons of mass destruction. They contribute to what the monk and ecologist Thomas Berry called the biocide of our planet. In evolutionary time the neo-cortex of our species is astonishingly recent. Homo sapiens can adapt. Art reaches into the imagination where that adaptation has to start. Julia Skeen’s paintings do that. 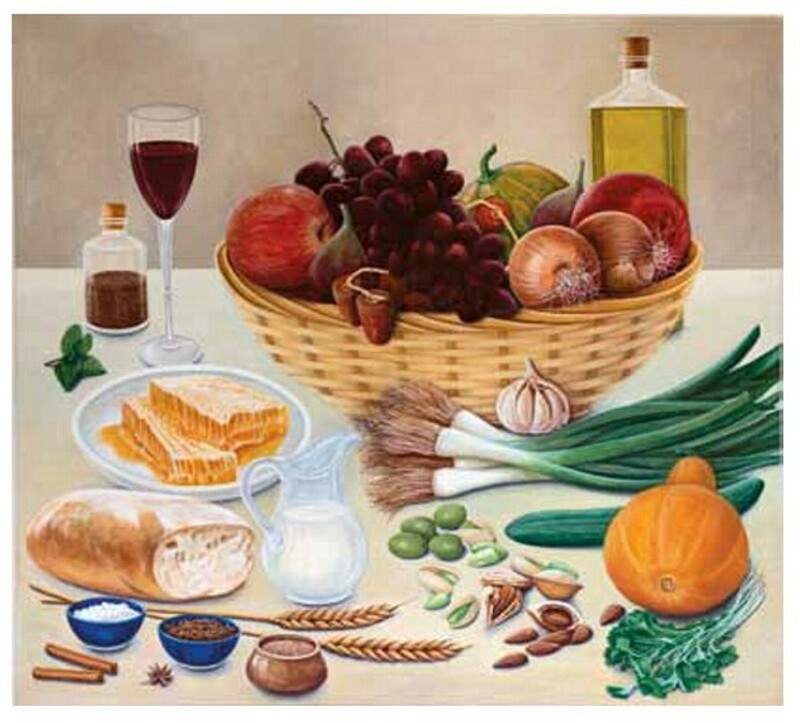 She enlarges images of grapes, olives, wheat and pomegranates so that we see them much more vividly than before. She links them to poetic passages from the King James’ Bible, thus giving them the resonance of a sacred tradition. Open the fridge at home after absorbing these paintings. I find it is difficult not to see the fruits and vegetables differently. The power of these paintings is not only in their technical accomplishment but in the way they transform our vision of what is before our eyes each day. An artist cannot do much more than that. The fridge is a rectangular metal cabinet which stores an astonishing array of imaginatively packaged commodities. These paintings prompt us to see the fridge and its contents in a new way, as a tabernacle in the wilderness of the city. Julia Skeen’s works move us to say grace before we eat, challenge our common habits of thought and stir us to adapt our industrial culture to the biosphere. Julia Skeen, Take, Eat, oil on canvas 1050 x 950 mm. 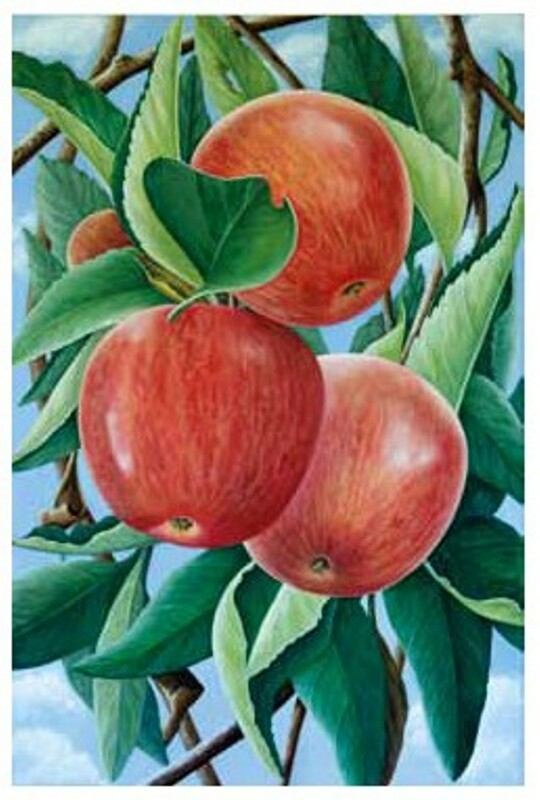 Julia Skeen, Apples, oil on canvas 610 x 915 mm. 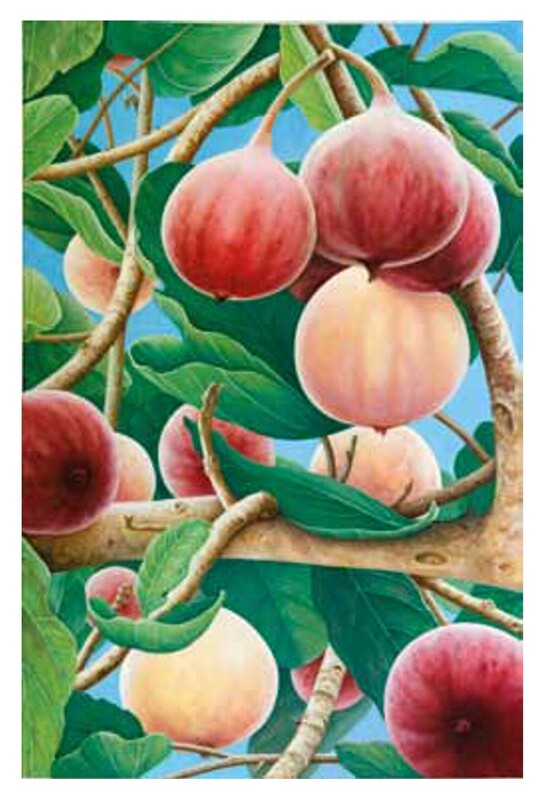 Julia Skeen: Fig Tree and Fruit, oil on canvas 610 x 915 mm. 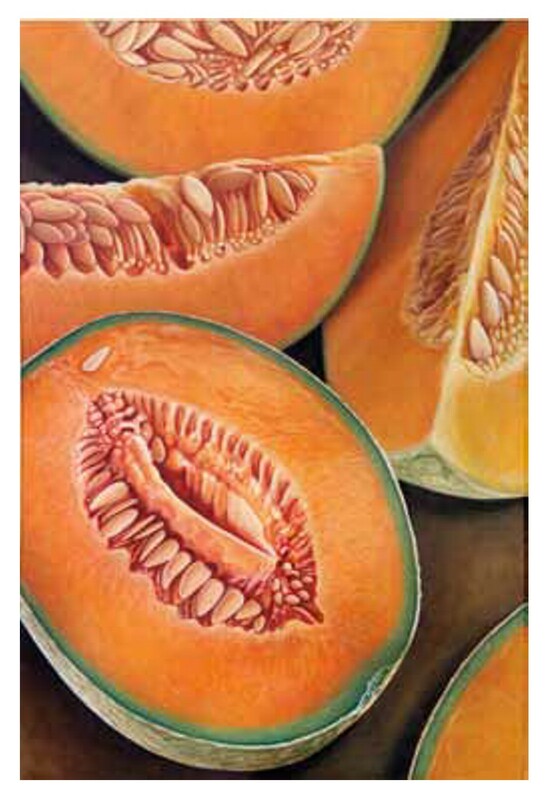 Julia Skeen: Melons, oil on canvas 610 x 915 mm. Chris Mann is one of South Africa’s best known poets. He and his wife Julia Skeen work together on numerous joint projects. For examples of faith poems. Please go to www.chrismann.co.za.